Blade angles left and right manually up to 45 degrees in forward position and 30 degrees in reverse position (7 Forward positions in 15 degree increments and 3 reverse positions in 30 degree increments): Many angles for diverse jobs and results. Blade offsets left or right up to 26": Manually rotate main frame in 15° increments up to 45 degrees to cover either tractor tire and to allow operators to work next to retaining walls, abutments, and curbing. 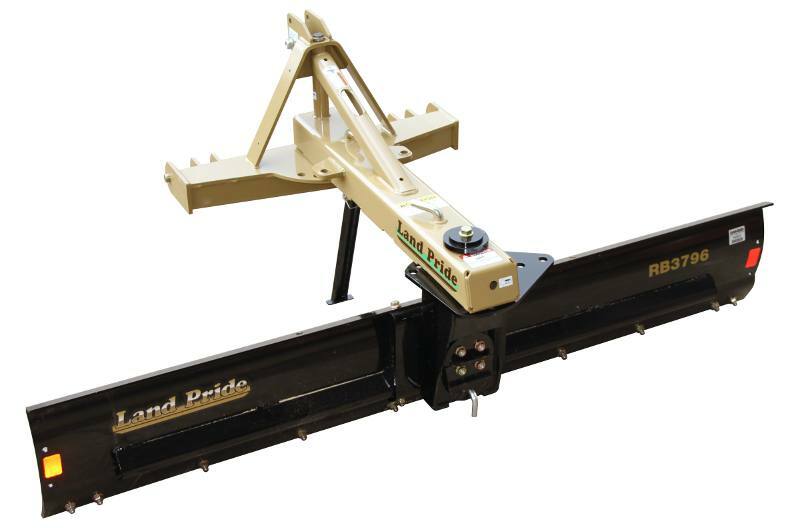 Blade tilts up or down up to 30 degrees (5 positions: Center, 2 clockwise, and 2 counterclockwise): Allows operator to do simple tasks such as putting a crown in the middle of a road to making V-type ditches. 17" High Moldboard: Rolled moldboard allows material to flow easily, which means less drag, less HP. 17" High moldboard for excellent capacity: Reversible cutting edge for twice the life. Skid shoes (optional): Help protect from hitting low obstructions by keeping the cutting edge off the ground. Set skid shoes to clear obstructions like manhole covers and street cracks. Blade Width: 83 1/2 in.